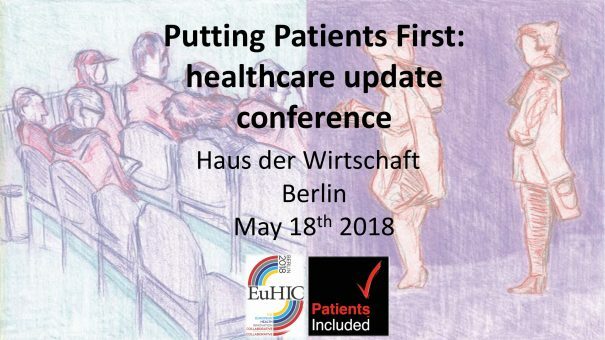 Join us in Berlin on 18th May for a patient-centered conference. Patient-centricity is currently a hot topic. Industry and healthcare innovators have become more accepting of the patient as a key stakeholder in the healthcare journey. However, it is common for patient focus to appear on the surface whilst behind the scenes little changes. Healthcare conferences are a good example of this. Research, treatment and illness are often discussed without the inclusion of patients in either the faculty or audience. ‘Putting Patients First’ is unique in its format. This multidisciplinary, not-for-profit conference explores issues in current and future healthcare from the perspective of patients, families and carers. (Lunchtime debate) what annoys us? The patient’s and doctor’s view. Patient-centered healthcare: can we afford it? There will also be personal journeys, a scientific poster display, stands from the European Patient Academy (EUPATI) and the National Institute for Health Research (NIHR) Innovation Observatory, an exhibition of artwork by Tony Pickering entitled The Art of Being a Patient and an end-of-conference networking event with musical accompaniment. The event is fully catered.